How to extend the life of your awning and keep it strong for years to come! Awnings, like anything else, need some attention every now and again to maintain their quality! It is not recommended to use any detergent whatsoever! Even washing up liquid can cause major damage to your fabric so avoid this. If you must use something then it is possible to use a very mild soap. You will need to lather this in your hands and then apply it delicately with your fingertips and use a brush to take it off. Brushes used to clean your car are ideal! Tips on Caring for Your Awning Canvas!! Under no circumstances should you use spirits, polishes or any kind of chemical on your PVC windows! You will be heading for an awning disaster! It is always easier to clean your awning once it is erected and attached to your caravan as this makes those awkward areas easier to reach. Stubborn stains may take a few times to clean but should spruce up nicely with a bit of elbow grease! Remember Though; No Chemicals! 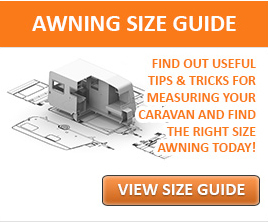 So you’ve taken your new awning away with you and had a bit of typical British weather! But wait, your awning isn’t keeping you dry?! Don’t panic! In the industry we call this Weathering. When you invest in a brand new awning the last thing you expect is to get a shower of rain coming through the material. Rest assured this is very normal. When an awning is new and it is exposed to outdoor [and English!] weather conditions it will often let a small [or large] amount of water through. This happens when two pieces of awning material are stitched together it creates holes in the material that the stitching is threaded through. The holes in the material are larger than the stitching itself; creating gaps that water can run through. The material needs to get wet and then dry out again, possibly more than once. This will create a reaction in the stitching making it swell up to fill the holes more completely sealing all leaks. Some lightweight porches now come with tape running along the inside of the stitching. If you have an awning with taped seams you shouldn’t have this issue along those particular seams but you could have the problem with the stitching along the beading that’s attached to the awning channel. Some manufacturer’s advice that the weathering process can take up to 3 exposures before the awning is completely waterproof. If you are still struggling after three exposures to rain you should probably contact us. Tip: When your awning is a few years old it may start to lose the strength of the waterproofing treatment. We recommend “Isabella’s Aqua tex” reproofing spray! Remember to clean your awning first though!